Data mining is one of the current vital fields for all types of data including spatial data. An example of useful extracted patterns from spatial data is to describe changes in metropolitan poverty rates based on city distances from major highways. Geospatial is a term that has recently been gaining in popularity; moreover, many applications on geospatial have different uses in different fields such as geo-tagging, geospatial technology, and geo-fencing. Analyzing spatial data is considered a complex task due to its details as it is related to locations with a special representation such as longitude and latitude. Other attributes are involved in the description of objects which can be analyzed using different data mining techniques. 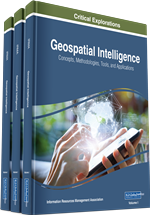 In this chapter, a demonstration of the basic information is performed considering spatial data and spatial data mining including all aspects such as the different type of data, different methods of analysis, different mining techniques, and other related topics. GIS (Geographic Information System) simply considered a computer system that enables users to do some analytical processing by capturing, storing, retrieving, sorting, and comparing spatial data. GIS provides various types of patterns displayed on different kinds of generated map with different resolutions that allow users to see the map features more easily and clearly which enable them to more understand the relationships among these patterns (ESRI, 2015) . GIS provides user with detailed gathered information about geographic places and their spatial relationships. It is considered as a framework concerned with collecting information, providing relationships and making some analytical image processing (ESRI, 2015) . GIS provides a set of layers as in Figure 1 after interpreting and translating the captured features on a map. These layers represent the spatial data and the relationships among them that reflected from the map processing like for example roads, rivers and political boundaries as in Figure 1 (ESRI, 2015). Simply is the information about the locations and geographic features reflected on the processed maps stored as coordinates and topology (ESRI, 2015). There are two main types of spatial data Raster data and Vector data providing different ways in representing and storing data (ESRI, 2015). Represents data of the real world patterns as points, line and polygons. Streets, Land parcels and lighting poles are examples of vector data storing them as separated boundaries (ESRI, 2015). Point: Simply defined by its coordinates. Line: The sequence of points connected together within a line. Polygon: The sequence of connected lines. Unlike vector data model, the real world on a map is divided into grid of cells as in Figure 2. The advantage over vector data is storing. Advanced GIS users as in Figure 3 (researchers, experts). Statisticians, who do not use GIS tools but use statistical tools as in Figure 4. Ordinary users with no GIS experience.